Do you have a layover in San Juan? Is your flight arriving early in the morning and you can get on the cruise ship until after 3pm? Why not spend your time in Puerto Rico shopping? 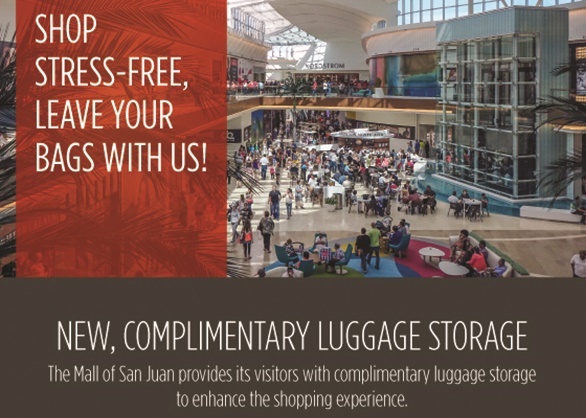 The Mall of San Juan, a world class shopping experience in San Juan Puerto Rico, has announced that they will hold your luggage while you shop. The mall feature unique fashion retailers, a kids play area and fine dining restaurants. The mall is located 10 minutes from the San Juan International Airport across from the San José Lagoon at the south end of the Teodoro Moscoso Bridge in San Juan, Puerto Rico. Royal Star offers transfers to and from the mall. The service includes the pickup in front of the terminal area by our fully bilingual professional chauffeur. The vehicle includes bottled water. The cost is $15.00 per person, 2 passenger minimum, each way. Gratuity not included. Call us at 787-253-2355 and use the promo code of MSJT.